There are many myths circulating about many different and well known bugs. Some of these myths may sound believable, and others are astoundingly unbelievable. However, sometimes, what sounds like just another falsehood, turns out to be true. For example, the rate at which a cricket chirps can indicate the outdoor temperature. This may sound like an old wives tale that you have never heard anyone utter, but according to one prominent scientist, this claim can be proven. If you want to know what the temperature is outside, but you don’t have access to a thermometer, and you can hear the chirping of crickets, then you can figure out how warm it is by counting the number of cricket chirps that you here in one minute, and then applying a little math. This is known as Dolbear’s law. It is hard to imagine how even the most curious mind in the world could have figured such a thing out, but the man’s name was A.E. Dolbear, and he was a professor at Tufts College. Dolbear first noticed a relationship between the number of cricket chirps and the ambient temperature. Apparently, there is a correlation between temperature and the rate of cricket chirps. When the temperature rises, crickets chirp more rapidly, and when the air cools, crickets chirp at slower rates. Not only that, but crickets always chirp at consistent rates. 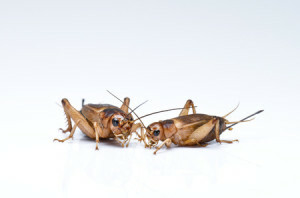 Crickets don’t just decide how rapidly to chirp. Since cricket chirps are consistent, and correlate with temperature, then Dolbear knew that a formula using a number of cricket chirps could be used to determine air temperature. Dolbear soon discovered a formula that determined an accurate temperature based on the rate of cricket chirps occurring during a certain amount of time. He then quickly published his finding back in 1897. Just go check it out online. And there are different formulas that are based on different cricket types, so you must know which type of cricket you are hearing in order to apply the proper formula. Luckily for Americans, the formula results in a fahrenheit temperature. Have you ever heard of Dolbear’s law before? Do you believe that this law is just another insect related myth? Do you think you will ever get around to testing the accuracy of the formula?